Washington Township High School Renaissance Club students (pictured), along with Kohl’s store associates, teamed up to beautify the school’s grounds. 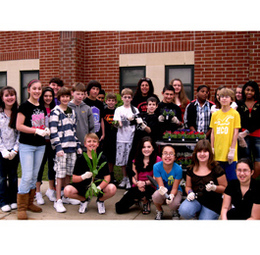 Students and associates collected 50 trash bags worth of garbage and weeds. As a part of the program, The Renaissance Club will receive a $1,500 grant from Kohl’s to help fund its recognition ceremony at the end of the year. At the fourth annual Washington Township High School Night at Citizens Bank Park, students and faculty participated in an array of activities before the start of the Phillies game. The Washington Township High School Concert Choir, led by Casey Corigliano, started the game off with a rendition of the national anthem. Two kindergartners at Countryside Elementary School participated in an educational wedding, in which Q, personified by kindergartener Ava Pugh, and U, played by classmate David Reick, were joined together for eternity. The ceremony served as a fun way for the children to learn about the very close relationship of Q and U in English spellings. Daniel Kimball, a fourth-grade student at Thomas Jefferson Elementary School, only wanted one thing for his 10th birthday: to see his father. Daniel’s father has served in the Navy for the past two-and-a-half years, and his job frequently takes him away from his family. But this year, Daniel got his wish and his father surprised him by showing up at his classroom to make Daniel’s 10th birthday his greatest yet. The members of Shawnee High School’s Students Actively Concerned service club organized a variety show that brought out their peers’ talents—acting, singing and cheerleading—in an effort to entertain the children at the Archway School for children with special needs and the Voorhees Pediatric Facility specialty care center.